Verb trans. & intrans. Jocular. Mid-19th century. Serve out (drinks); do a butler's work. 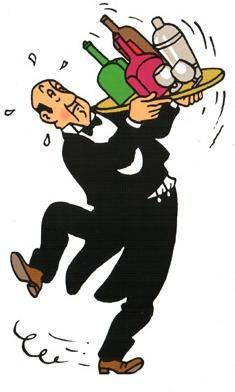 If you've ever been tempted to look down your nose at a butler (and I'm sure you haven't), it's possibly a reflection of a cultural attitude ingrained in our language: a butler is, after all, a servant, and the very etymology of butler is from 'bottle', because that's what butlers do, isn't it? They open bottles and, although its root is actually from the butler being in charge of the household's wine, seriously, how hard a job could that be? Well, if you have ever been tempted to be so supercilious, you should think again, as butlers (especially modern butlers) are both in a demanding job and very well compensated for their labours. Those that complete the City & Guild's Butlers Diploma, for example, can expect an entry level salary of £30,000, with the best quickly rising to salaries of £100,000 and above (one of the best paid butlers in the US is rumoured to earn around $1,500,000 per year). Perks include free accommodation, healthcare, a car and international travel. What's more, good butlers are in demand, so if you have the necessary skills and a skin thick enough to be some capricious oligarch's status symbol, you should have no problem finding (and keeping) employment. Not bad for someone that opens bottle (buttles) for a living, eh? Do you have a butler? Do please buttle your bottles in the comment box below. Wow. I'm in the wrong business. I think I'd be pretty good at buttling / buttlering (? ), especially for that money. Good to see a picture of Nestor. Haven't read a Tintin book in years. Good old Nestor. I wonder what pay bracket he was on ... ? After Downton Abbey, the only butler I can think of is Mr Caaaaaahson. (That was my futile attempt to transcribe the British accent without using the phonetic alphabet). Oh no ... I'm sorry, sorry, sorry. I really do think Mr. Carson is the butler. The valet was that other guy with the hat and the limp who got married to Anna, which was creepy as he was 50 years older than her. Oh for goodness sake ... how was I supposed to know you had access to Google?? Mr Bates ... grr ... yes, the creepy guy who's really boring and whose storylines no one cares about ... damn! I also fondly remember Hudson from the 1970s drama, Upstairs Downstairs. Both were authoritarian characters, but I think Hudson had a better sense of humour! Mr Carson, who we all know is Lord Grantham's personal valet (*sniggers mischievously again*), is one of the best and most memorable characters in Downton. I've never seen Upstairs Downstairs, I'm afraid, as it was a tiny bit before my time. I think I had a point of sorts there somewhere but I was kiboshed by the class system. It's the lower upper-middle-under-proletariat-aristochavs that I hate. I'm with you comrade - they're a privileged lefty bunch of bourgeois working class illuminati plebs. Up Marxism...... or fox-hunting, I think.